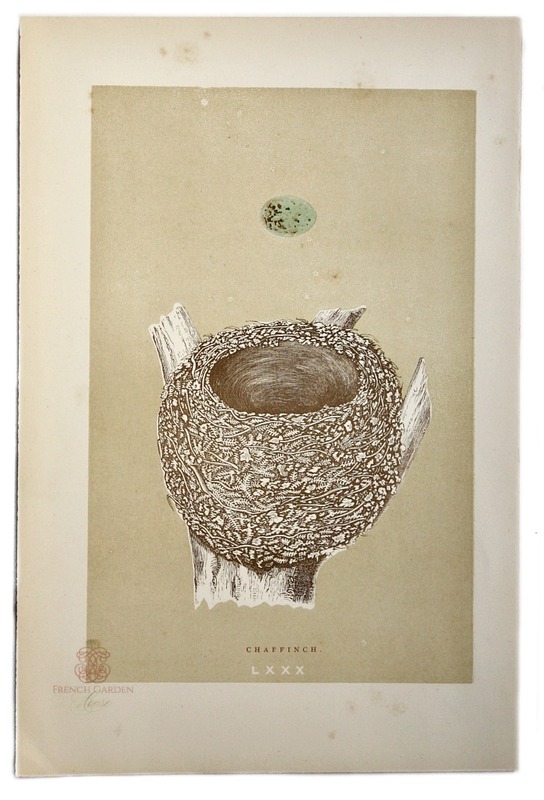 Original Antique Chromolithograph Print, a collectable book plate which was taken from a disbound Victorian Natural History book by Rev. Morris. The exquisite 1800's print is so decoractive, beautifully detailed and was printed on medium-weight, cream colored paper, blank on the reverse. Fabulous bright, clear colors as lush and beautiful as the day they were printed and paiinted by hand. Both the nest and egg are so gorgeous in their shades of golden brown and blue aqua green. To be expected in prints of this age, there may be a few characteristic areas of foxing etc., this print is in beautiful antique condition. Perfect to frame, loves the company of others. Display in a grouping, these nest prints make a stunning statement!